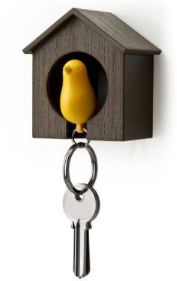 This adorable birdhouse key chain is a great accessory. It’s cute, it’s handy and it helps you live your life in style. All your friends will compliment you on your unique taste! the bird doubles as a safety whistle! This is extremely handy and makes is the perfect gift for a nature guide. It’s made out of recyclable materials, and is also wrapped in recyclable materials, making it both adorable and environmentally friendly! This product could be a prefect present to your friend who just got a new car. A small, meaningful gesture! This Artist Decorates Her Birdhouses On The Inside!